The AP Test is HERE!!! 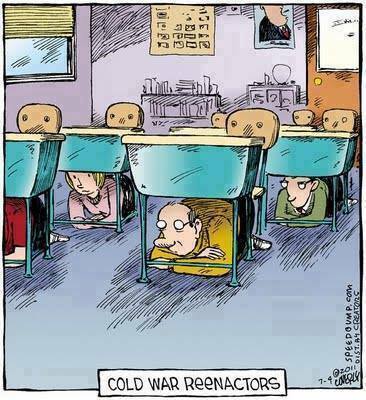 Posted by scoop2go in AP Review, Cold War, Test Preparation. Comments Off on The AP Test is HERE!!! Now, don’t be like that! You’re NOT going to BOMB it if you studied! You don’t need to duck and cover! Get out from under there and go get ’em! 1. What famous speech does Reagan use an image from in the first paragraph? What is the connection between these two speeches? 2. In what way was Marx right, according to Reagan? 3. How does the world refugee situation prove the superiority of capitalism and democracy, according to Reagan? 4. What is the purpose of our engagement in competition with the Soviet Union? — totalitarianism. Optimism comes less easily today, not because democracy is less vigorous, but because democracy’s enemies have refined their instruments of repression. 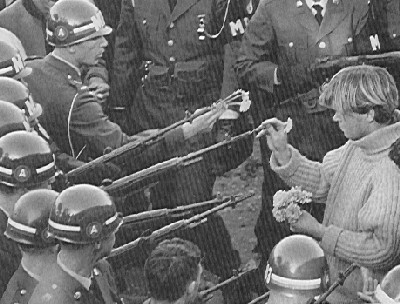 Yet optimism is in order because day by day democracy is proving itself to be a not at all fragile flower. From Stettin on the Baltic to Varna on the Black Sea, the regimes planted by totalitarianism have had more than thirty years to establish their legitimacy. But none — not one regime — has yet been able to risk free elections. Regimes planted by bayonets do not take root. The strength of the Solidarity movement in Poland demonstrates the truth told in an underground joke in the Soviet Union. It is that the Soviet Union would remain a one-party nation even if an opposition party were permitted because everyone would join the opposition party…. Historians looking back at our time will note the consistent restraint and peaceful intentions of the West. They will note that it was the democracies who refused to use the threat of their nuclear monopoly in the forties and early fifties for territorial or imperial gain. Had that nuclear monopoly been in the hands of the Communist world, the map of Europe–indeed, the world–would look very different today. 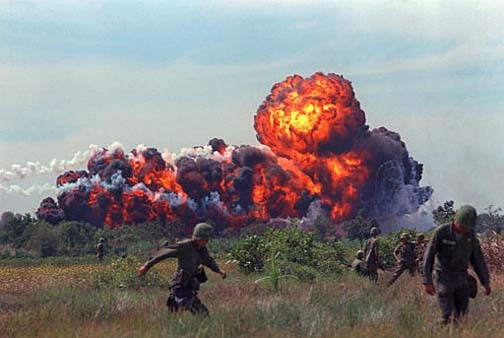 And certainly they will note it was not the democracies that invaded Afghanistan or suppressed Polish Solidarity or used chemical and toxin warfare in Afghanistan and Southeast Asia. If history teaches anything, it teaches self-delusion in the face of unpleasant facts is folly. We see around us today the marks of our terrible dilemma–predictions of doomsday, antinuclear demonstrations, an arms race in which the West must, for its own protection, be an unwilling participant. At the same time we see totalitarian forces in the world who seek subversion and conflict around the globe to further their barbarous assault on the human spirit. What, then, is our course? Must civilization perish in a hail of fiery atoms? Must freedom wither in a quiet, deadening accommodation with totalitarian evil? In an ironic sense Karl Marx was right. We are witnessing today a great revolutionary crisis, a crisis where the demands of the economic order are conflicting directly with those of the political order. But the crisis is happening not in the free, non-Marxist West but in the home of Marxism- Leninism, the Soviet Union. It is the Soviet Union that runs against the tide of history by denying human freedom and human dignity to its citizens. It also is in deep economic difficulty. The rate of growth in the national product has been steadily declining since the fifties and is less than half of what it was then. The dimensions of this failure are astounding: a country which employs one-fifth of its population in agriculture is unable to feed its own people. Were it not for the private sector, the tiny private sector tolerated in Soviet agriculture, the country might be on the brink of famine. These private plots occupy a bare 3 percent of the arable land but account for nearly one-quarter of Soviet farm output and nearly one-third of meat products and vegetables. Overcentralized, with little or no incentives, year after year the Soviet system pours its best resources into the making of instruments of destruction. The constant shrinkage of economic growth combined with the growth of military production is putting a heavy strain on the Soviet people. What we see here is a political structure that no longer corresponds to its economic base, a society where productive forced are hampered by political ones. The decay of the Soviet experiment should come as no surprise to us. Wherever the comparisons have been made between free and closed societies — West Germany and East Germany, Austria and Czechoslovakia, Malaysia and Vietnam — it is the democratic countries that are prosperous and responsive to the needs of their people. And one of the simple but overwhelming facts of our time is this: of all the millions of refugees we’ve seen in the modern world, their flight is always away from, not toward the Communist world. Today on the NATO line, our military forces face east to prevent a possible invasion. On the other side of the line, the Soviet forces also face east to prevent their people from leaving. The hard evidence of totalitarian rule has caused in mankind an uprising of the intellect and will. Whether it is the growth of the new schools of economics in America or England or the appearance of the so-called new philosophers in France, there is one unifying thread running through the intellectual work of these groups — rejection of the arbitrary power of the state, the refusal to subordinate the rights of the individual to the superstate, the realization that collectivism stifles all the best human impulses…. Chairman Brezhnev repeatedly has stressed that the competition of ideas and systems must continue and that this is entirely consistent with relaxation of tensions and peace. We cannot ignore the fact that even without our encouragement there has been and will continue to be repeated explosion against repression and dictatorships. The Soviet Union itself is not immune to this reality. Any system is inherently unstable that has no peaceful means to legitimize its leaders. In such cases, the very repressiveness of the state ultimately drives people to resist it, if necessary, by force. While we must be cautious about forcing the pace of change, we must not hesitate to declare our ultimate objectives and to take concrete actions to move toward them. We must be staunch in our conviction that freedom is not the sole prerogative of a lucky few but the inalienable and universal right of all human beings. So states the United Nations Universal Declaration of Human Rights, which, among other things, guarantees free elections. This is not cultural imperialism; it is providing the means for genuine self-determination and protection for diversity. Democracy already flourishes in countries with very different cultures and historical experiences. It would be cultural condescension, or worse, to say that any people prefer dictatorship to democracy. Who would voluntarily choose not to have the right to vote, decide to purchase government propaganda handouts instead of independent newspapers, prefer government to worker-controlled unions, opt for land to be owned by the state instead of those who till it, want government repression of religious liberty, a single political party instead of a free choice, a rigid cultural orthodoxy instead of democratic tolerance and diversity. Since 1917 the Soviet Union has given covert political training and assistance to Marxist-Leninists in many countries. Of course, it also has promoted the use of violence and subversion by these same forces. Over the past several decades, West European and other social democrats, Christian democrats, and leaders have offered open assistance to fraternal, political, and social institutions to bring about peaceful and democratic progress. Appropriately, for a vigorous new democracy, the Federal Republic of Germany’s political foundations have become a major force in this effort. It is time that we committed ourselves as a nation — in both the public and private sectors — to assisting democratic development…. What I am describing now is a plan and a hope for the long term — the march of freedom and democracy which will leave Marxism-Leninism on the ash heap of history as it has left other tyrannies which stifle the freedom and muzzle the self-expression of the people. And that’s why we must continue our efforts to strengthen NATO even as we move forward with our zero-option initiative in the negotiations on intermediate-range forces and our proposal for a one-third reduction in strategic ballistic missile warheads. Our military strength is a prerequisite to peace, but let it be clear we maintain this strength in the hope it will never be used, for the ultimate determinant in the struggle that’s now going on in the world will not be bombs and rockets but a test of wills and ideas, a trial of spiritual resolve, the values we hold, the beliefs we cherish, the ideals to which we are dedicated. The British people know that, given strong leadership, time, and a little bit of hope, the forces of good ultimately rally and triumph over evil. Here among you is the cradle of self-government, the Mother of Parliaments. Here is the enduring greatness of the British contribution to mankind, the great civilized ideas: individual liberty, representative government, and the rule of law under God. Well, the task I’ve set forth will long outlive our own generation. But together, we too have come through the worst. Let us now begin a major effort to secure the best – a crusade for freedom that will engage the faith and fortitude of the next generation. For the sake of peace and justice, let us move toward a world in which all people are at last free to determine their own destiny. 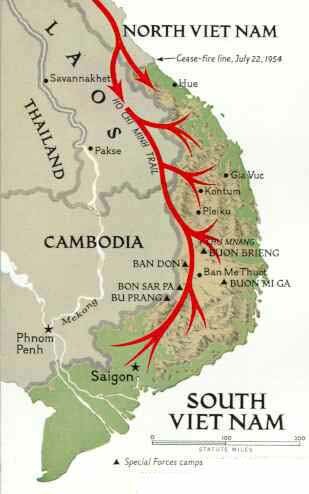 This series of trails connected Viet Cong guerillas in the South with supplies from the North. 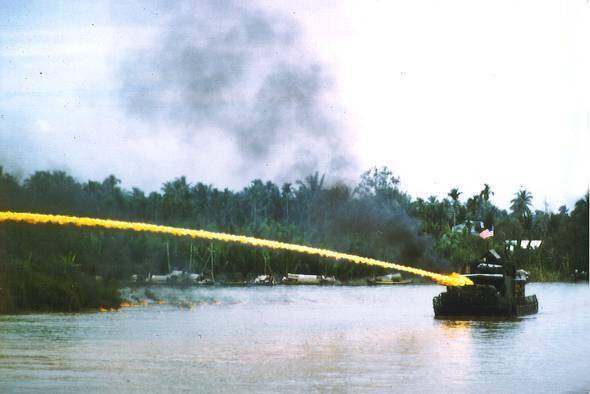 … or sprayed from riverboats. The goal was to expose VC hiding places. 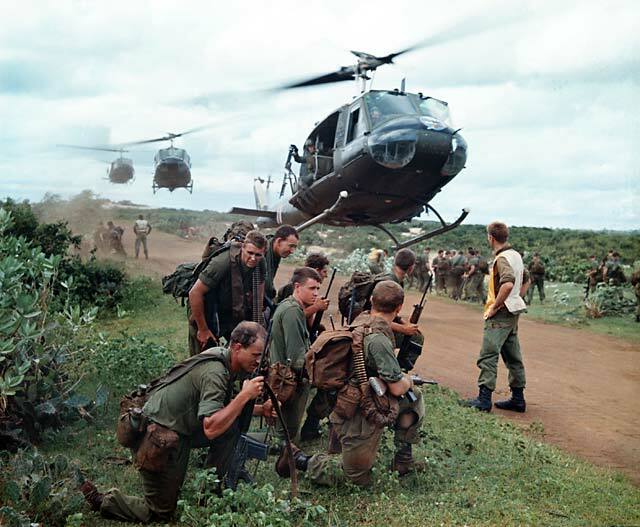 Troops were often deployed via helicopters given the jungle terrain. 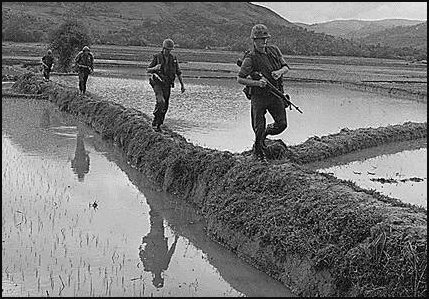 Troops would be deployed on patrol through rice paddies besides being in more heavily vegetated areas. 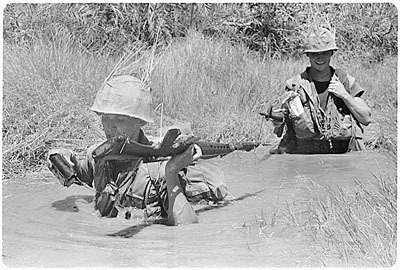 These young Marines are on patrol south of Da Nang. 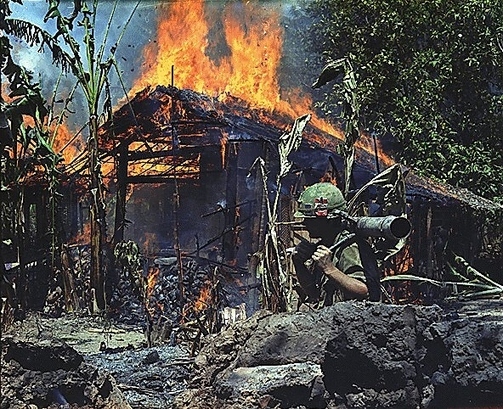 Burning a suspected VC headquarters after a search-and-destroy mission. A protest on the National Mall in 1967. 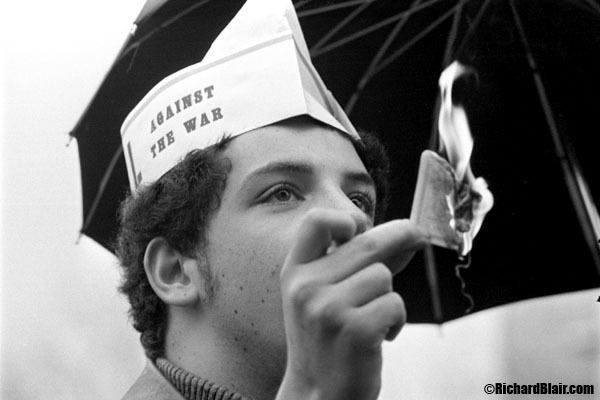 Meanwhile, on the home front, support for the war– and for the draft– waned, and protests started increasing by 1967 as Johnson’s policies as guided by Defense Secretary McNamara escalated the American presence in the fighting. A poster advising young people on ways to resist the war effort. Burning a draft card– of course, you could still be drafted. A popular folksong at the time asked: Where have all the flowers gone? They’ve been shoved into rifle barrels, of course. Our soldiers paid a very heavy price physically as well as mentally. 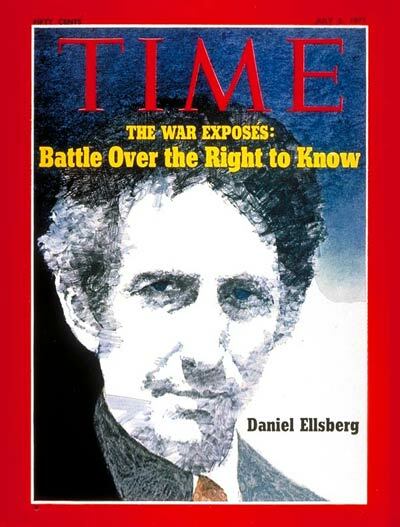 in 1970, the Pentagon Papers rocked the nation’s faith in how honest the government was about the war. 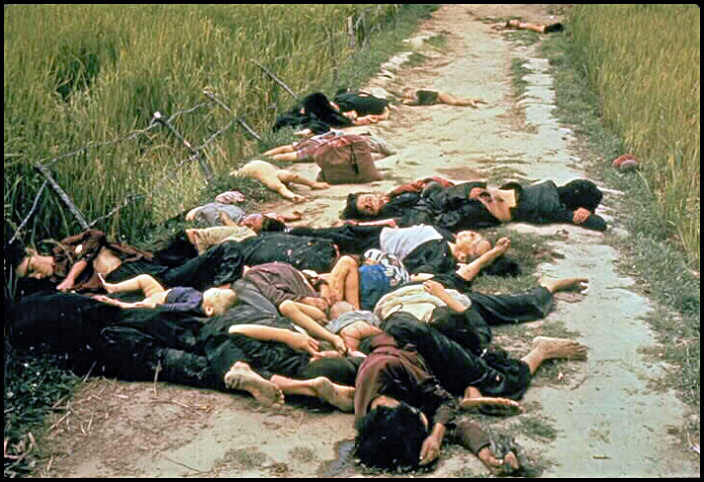 And then news of the My Lai incident hit the papers in 1970, as well, and protests grew even more pronounced. 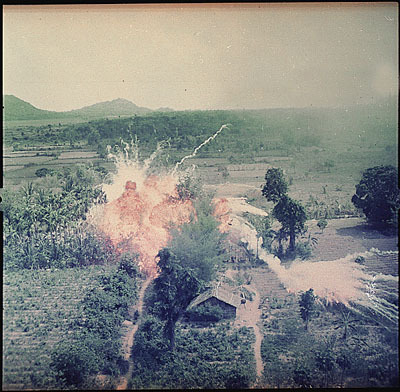 Children burned by napalm dropped by the Vietnamese Air Force. This photograph won many awards and became iconic. 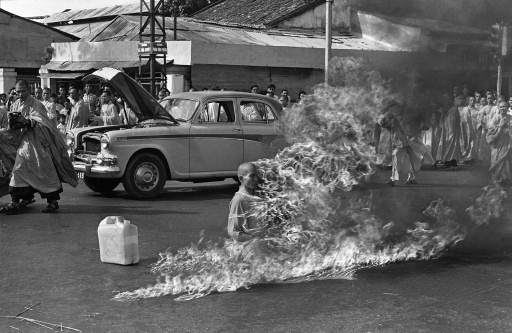 The young girl, Kim Phuc, survived and is an activist to this day. For more information about Kim Phuc, go to this post, which has a link. 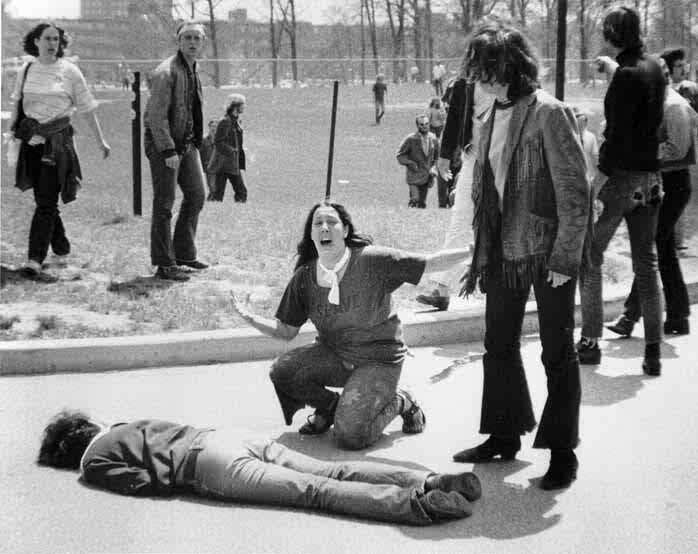 … and then “Four Dead in Ohio” as Crosby, Stills, Nash and Young sang after the National Guard opens fire. 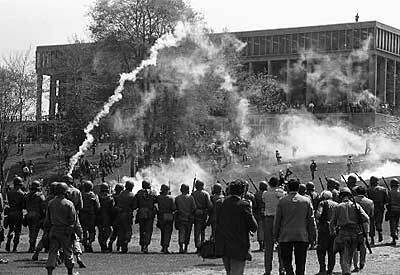 Nine other students were wounded– one paralyzed. 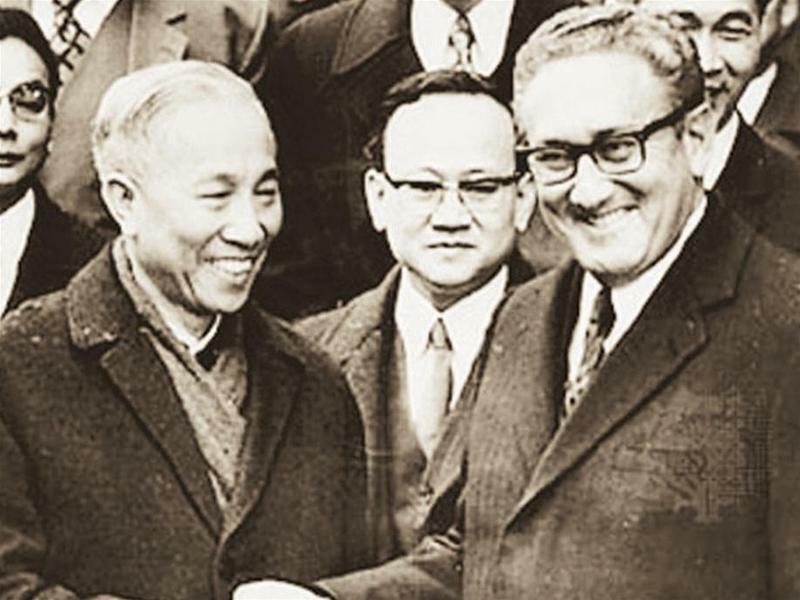 Henry Kissinger and Vietnamese Foreign Minister Le Duc Tho meet to attempt peace talks in 1972. 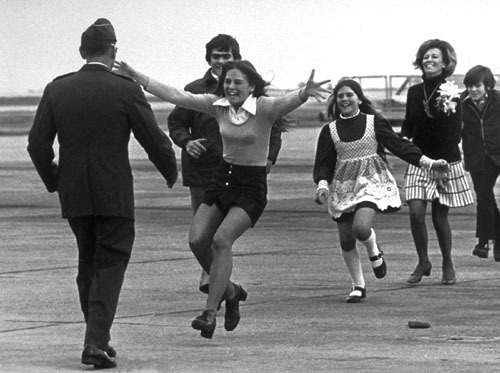 Released prisoner of war Lt. Col. Robert L. Stirm is greeted by his family at Travis Air Force Base in Fairfield, Calif., as he returns home from the Vietnam War, March 17, 1973. 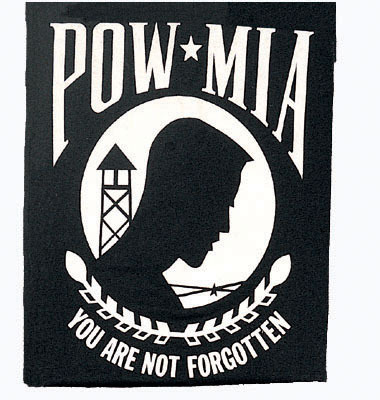 After the Paris Peace Talks were concluded in 1973, POWs were released by the North Vietnamese. Here is a link to a news article of how Lt. Col. Stirm’s family was changed after this famous photo. The picture above is famous, and the picture below includes someone famous now. 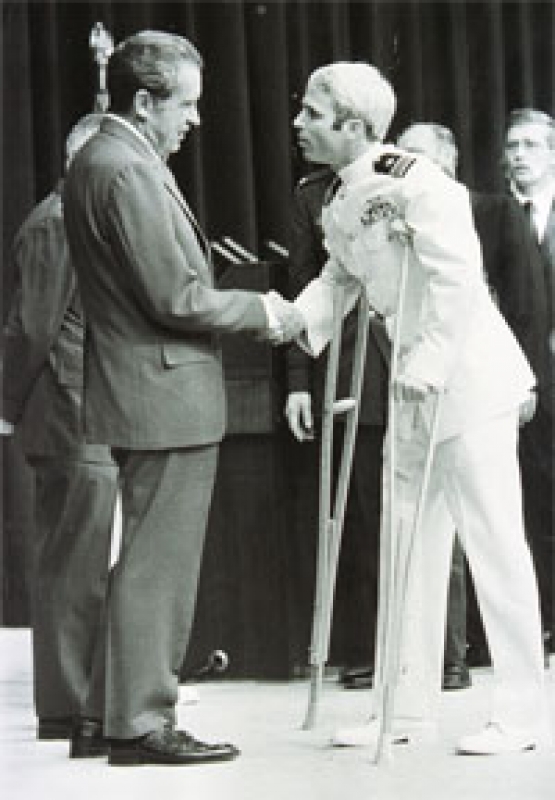 John McCain is welcomed home by President Nixon. 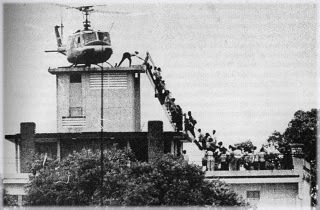 During the fall of Saigon in 1975, desperate Vietnamese try to get on one of the last helicopters leaving the US embassy. 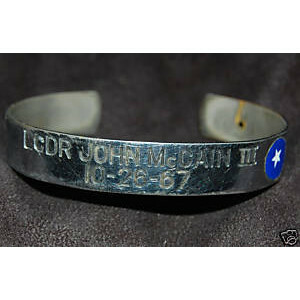 Some of us wore bracelets with the names of POWs and MIAs during the war. I had one as a child, (but not this one). I seem to recall that if the person on your bracelet was recovered their bracelet could be sent to them so that they would know that people had been thinking of them. 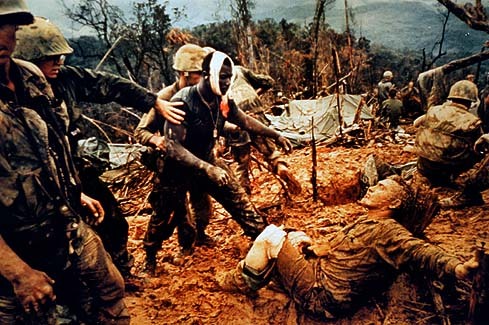 One program encouraged people to wear bracelets with the names of missing or captured troops on them– kind of like those elastic armbands for causes today, but more personal. But not everyone came home. 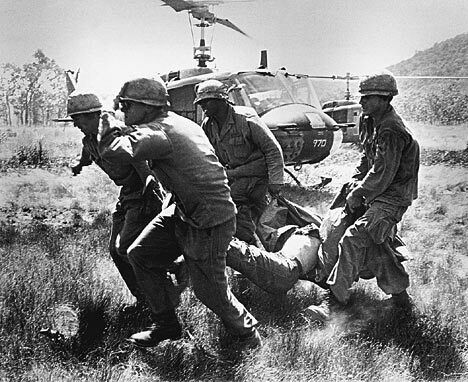 There are still MIAs from the Vietnam War, and remains of missing servicemen are sometimes located and returned even today. First, if you haven’t seen this gem of a movie, you must treat yourself. So well done! The Iron Giant is set in the late 1950s/early 1960s. It portrays so well the fear of the unknown–and the ultimate dangers of the Arms Race and the paranoia that was produced during the Cold War, when people lives every day with the fear that life could be obliterated in a matter of moments. In this scene, Hogarth, a kid who is considered nerdy and odd because he is very smart, is daydreaming as the class is shown a PSA (Public Service Announcement) on what to do in a nuclear attack. At the same time, there are rumors around town that a giant monster is roaming around– and Hogarth knows more than he is letting on. Not the irony of the last 15 seconds of the very brief clip. What is the irony of this clip compared to the “Daisy” commercial below? Vice President Johnson, Mr. Speaker, Mr. Chief Justice, President Eisenhower, Vice President Nixon, President Truman, reverend clergy, fellow citizens, we observe today not a victory of party, but a celebration of freedom — symbolizing an end, as well as a beginning — signifying renewal, as well as change. For I have sworn before you and Almighty God the same solemn oath our forebears prescribed nearly a century and three quarters ago. We dare not forget today that we are the heirs of that first revolution. Let the word go forth from this time and place, to friend and foe alike, that the torch has been passed to a new generation of Americans — born in this century, tempered by war, disciplined by a hard and bitter peace, proud of our ancient heritage — and unwilling to witness or permit the slow undoing of those human rights to which this Nation has always been committed, and to which we are committed today at home and around the world. To those old allies whose cultural and spiritual origins we share, we pledge the loyalty of faithful friends. United, there is little we cannot do in a host of cooperative ventures. Divided, there is little we can do — for we dare not meet a powerful challenge at odds and split asunder. To those peoples in the huts and villages across the globe struggling to break the bonds of mass misery, we pledge our best efforts to help them help themselves, for whatever period is required — not because the Communists may be doing it, not because we seek their votes, but because it is right. If a free society cannot help the many who are poor, it cannot save the few who are rich. To our sister republics south of our border, we offer a special pledge — to convert our good words into good deeds — in a new alliance for progress — to assist free men and free governments in casting off the chains of poverty. But this peaceful revolution of hope cannot become the prey of hostile powers. Let all our neighbors know that we shall join with them to oppose aggression or subversion anywhere in the Americas. And let every other power know that this Hemisphere intends to remain the master of its own house. To that world assembly of sovereign States, the United Nations, our last best hope in an age where the instruments of war have far outpaced the instruments of peace, we renew our pledge of support — to prevent it from becoming merely a forum for invective — to strengthen its shield of the new and the weak — and to enlarge the area in which its writ may run. So let us begin anew — remembering on both sides that civility is not a sign of weakness, and sincerity is always subject to proof. Let us never negotiate out of fear. But let us never fear to negotiate. 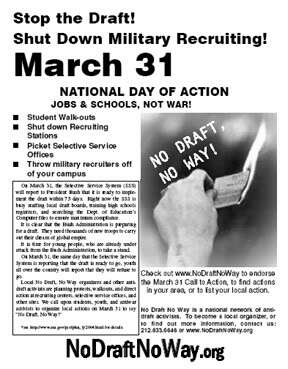 Let both sides, for the first time, formulate serious and precise proposals for the inspection and control of arms — and bring the absolute power to destroy other nations under the absolute control of all nations. Now the trumpet summons us again — not as a call to bear arms, though arms we need; not as a call to battle, though embattled we are — but a call to bear the burden of a long twilight struggle, year in and year out, “rejoicing in hope, patient in tribulation” — a struggle against the common enemies of man: tyranny, poverty, disease, and war itself. In the long history of the world, only a few generations have been granted the role of defending freedom in its hour of maximum danger. I do not shank from this responsibility — I welcome it. I do not believe that any of us would exchange places with any other people or any other generation. The energy, the faith, the devotion which we bring to this endeavor will light our country and all who serve it — and the glow from that fire can truly light the world. Three days before leaving office, Eisenhower warns against heedless pursuit of weaponry. Only a former general of Eisenhower’s stature could have said this and not been criticized for weakness. “Beating ploughshares into swords” is a Biblical reference (Isaiah 2:4 and Joel 3:10). A plow has a blade, and a sword has a blade, but one is used for peace, while the other is used for war. Beating ploughshares into swords means preparing for war. Beating swords into ploughshares means giving up war.